We’ve just finished up another week of summer time Fun and Adventure and what a wonderful week we’ve had!!! It was an Adventure in Paradise!!! One we won’t soon forget!!! It was thumbs up all the way!!! We spent the week boating up and down the intra coastal, snorkeling the Rock Garden, exploring the Big Sandbar, fishing my secret spots and catching tons of fish non stop! We went offshore on the calm mornings and caught one bonita after another! 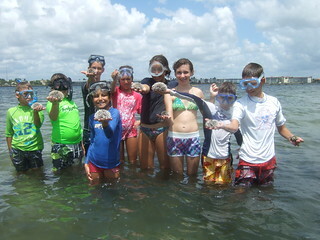 We found every kind of crab, starfish and sea urchin you could find! 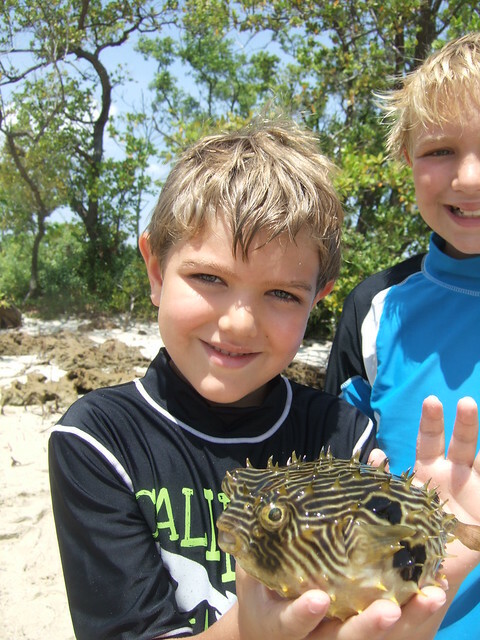 We caught giant porcupinefish, atlantic yellow rays, sharp-nosed pufferfish and striped burrfish in our nets day after day!! 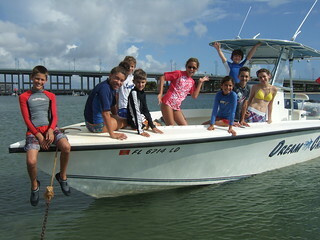 !Another day we watched manatees eat sea grass all around the boat and caught tons of crabs in our crab traps! And all that isn’t even half of it!!! It just doesn’t get any better than that!!! 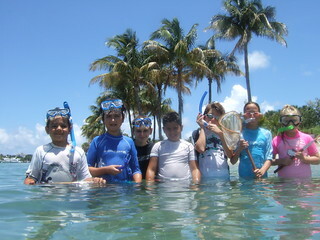 Each morning we would snorkle the shallow sandbars around Peanut Island. 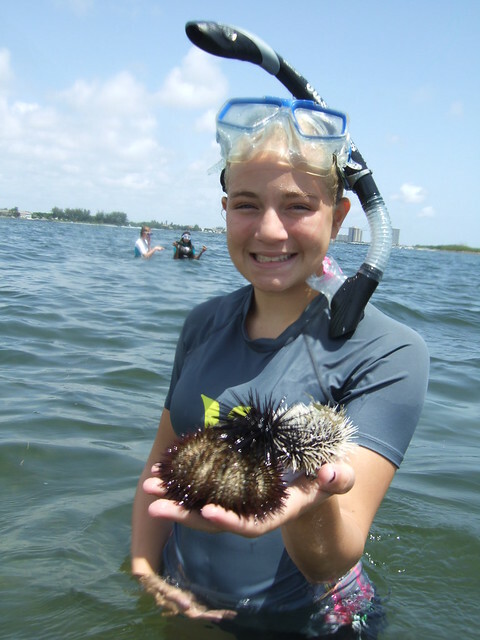 When we weren’t finding starfish, we were chasing after puffers, porcupinefish and more. It was awesome!!! You can tell we were having FUN on this day!!! Wish you could have been there!!! We had a blast!!! 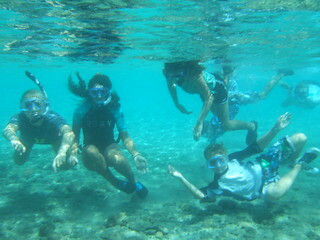 We spent an hour or so each day snorkeling the Rock Garden and watching hundreds of species of fish swim all around us. 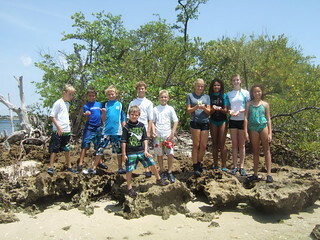 We found conchs, sea cucumbers and hermit crabs by the hundreds! 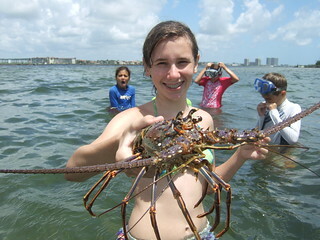 We had a ball chasing after big swimming crabs and catching them in our hand nets, one right after another!!! I know Shane had fun catching this one!!! 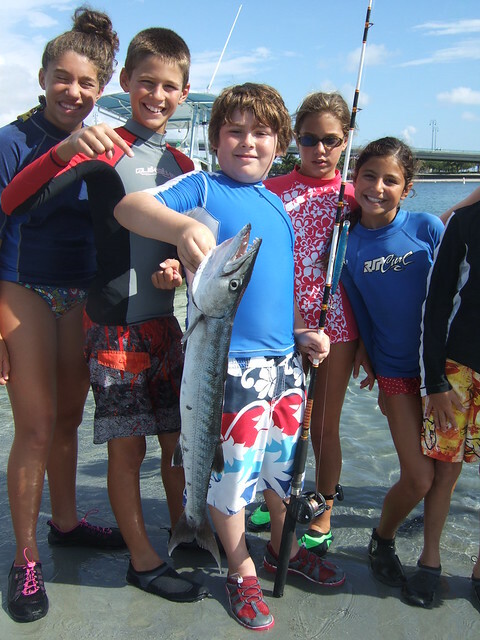 We went seine netting the grass flats and discovered juvenile barracudas, puffers, pipefish, pink shrimp and grass shrimp, lane snappers, hogfish and tons of others. I think our favorite discovery on that day was a tiny trunkfish that looked like a fish in a box. It was just great!!! 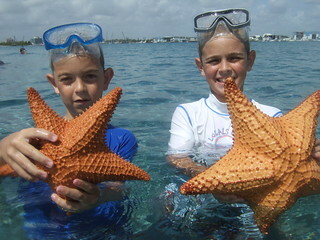 We found 9 armed starfish, cushion starfish and beaded starfish on every day we visited the sandbar. 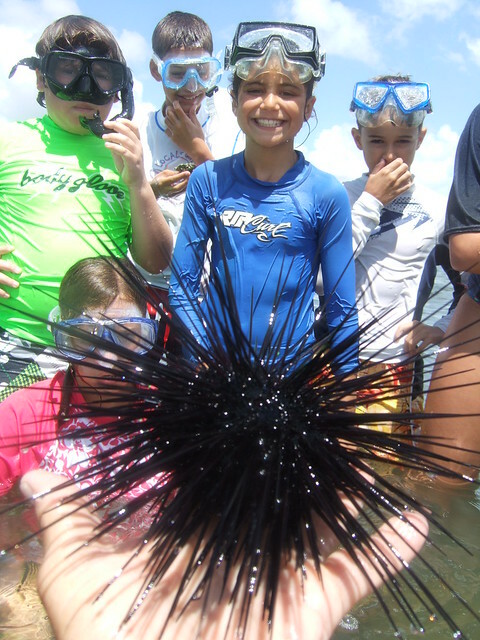 We found hundreds of variegated sea urchins, west indian sea eggs, reef urchins and even a few long spined urchins as well. 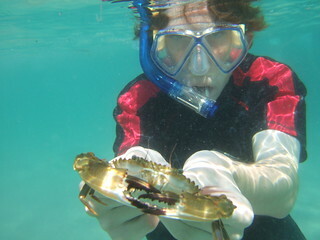 We even came up with a couple of nice lobster to check out up close and personal. Needless to say, it was non-stop adventure from start to finish!!! All week long!!! A real Adventure in Paradise!!! You should have been there!!! I can’t wait to do it all over again, next week!!! 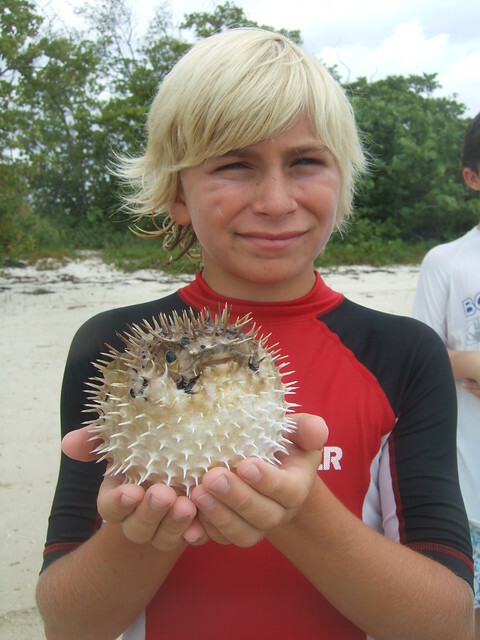 Fletcher with a giant porcupinefish! 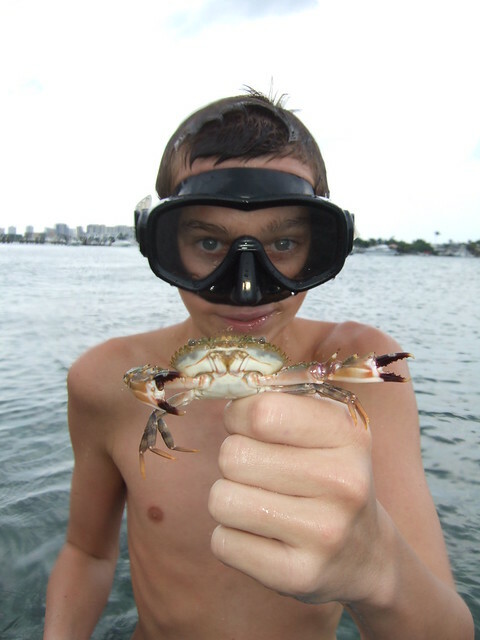 Dylan catches a swimming crab! 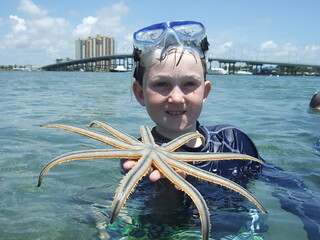 Oliver with a starfish hairdo! 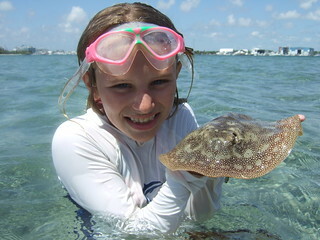 Lily with a barbless yellow ray! 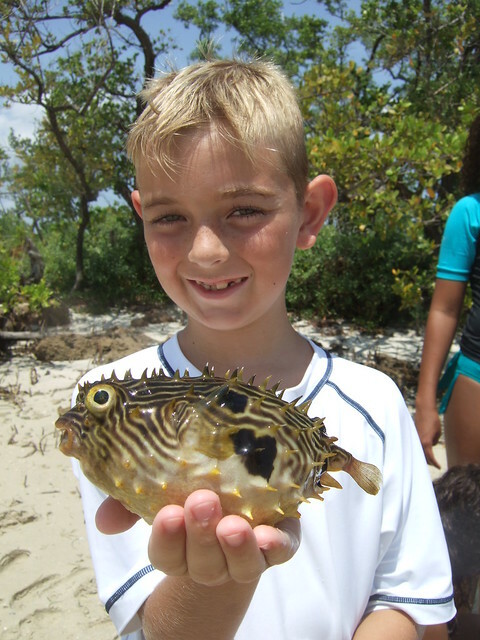 Conner with a striped burrfish! Michael with a Big-Mouthed Bonita! 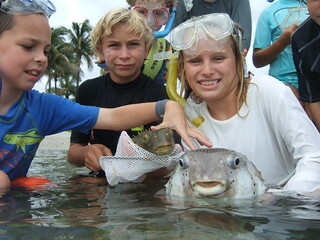 Maddie with a Giant porcupinefish! 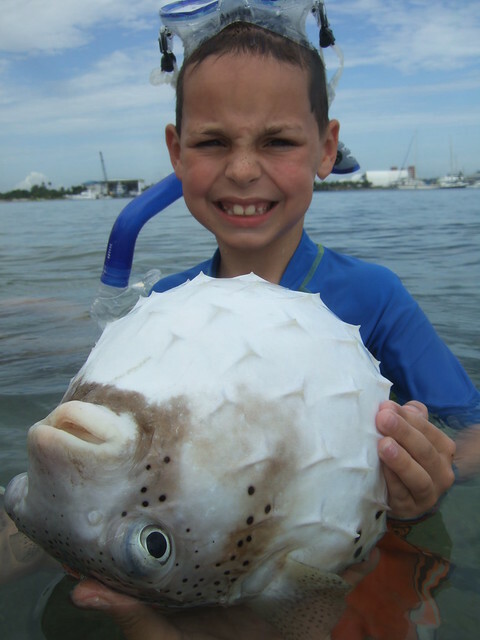 Connor catches a long-spined burrfish! 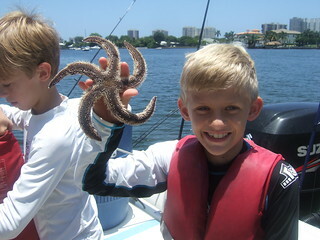 Spencer finds an awesome 9 armed starfish! To check out the rest of the photos from this weeks session, please click on “Check out our FLICKR photostream” found a little bit down on this home page on the right side and go to “July 17 – 20, 2012 AM session”. NON-STOP ADVENTURE FUN!!! Afternoon Session. I’m finally getting a chance to finish up the afternoon blog for last week, July 10 – 13, 2012 session. I’ve been so crazy busy doing double sessions, birthday parties and custom trips on weekends that I haven’t had a chance to get to it yet! I guess I”ve just been too busy having fun and adventure!!! what can I say… Sometimes having too much FUN can be exhausting!!! To begin with though, let me just say the afternoon session had as much Non-Stop Adventure Fun as the morning group did for the week. Everything was phenominal and we had a blast from the very first second till the moment we had to come back!!! 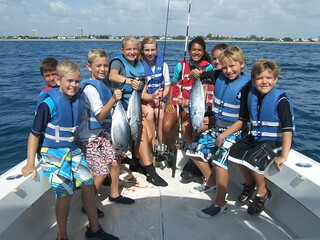 And just like the morning group, these kids were just GREAT and ready for adventure too!!! And Adventure we had!!! Group photo by the beach. Thru-out the week, we had some fabulous manatee encounters also, caught plenty of BIG barracudas, found tons of starfish and sea urchins, caught all sorts of crabs, pufferfish and striped burrfish in our hand nets, enjoyed snorkeling the Rock Garden, Peanut and Munyon Island, chased blennies and gobies around the rocks, and basically had the time of our lives!!! It was non-stop FUN!!! Wish you could have been there! 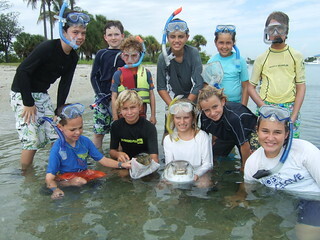 On our fishing day we went to my secret snapper hole and the snappers had moved back in by the hundreds!!! Before we knew it, there were a dozen big snappers in the boat, and plenty of big barracuda around the boat trying to eat them before we could get them in!!! It was just great! 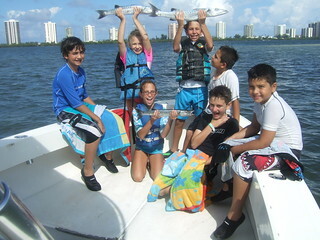 Everybody was having a blast and catching snappers one right after the other!!! Just the way I love it! 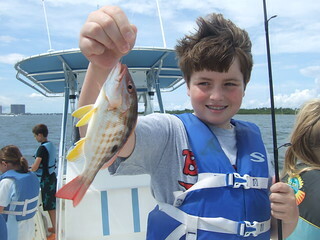 Tommy catches a BIG lane snapper. 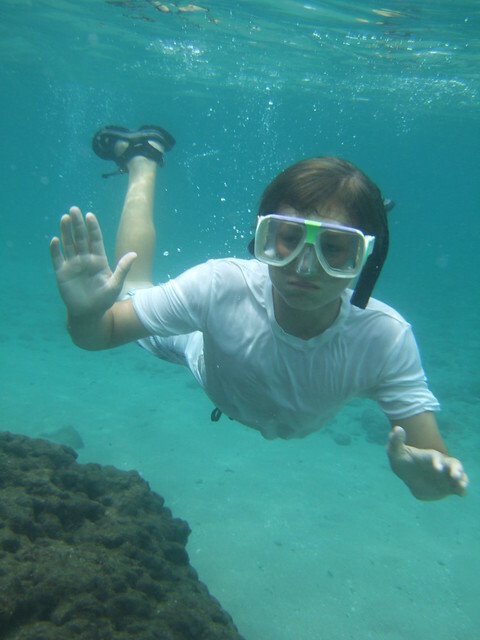 Later that day we snorkeled around the shallow bar around Peanut Island and had so much FUN chasing crabs, sharp-nosed pufferfish and big, striped burrfish with our nets that we didn’t want to go home when it was time to leave! 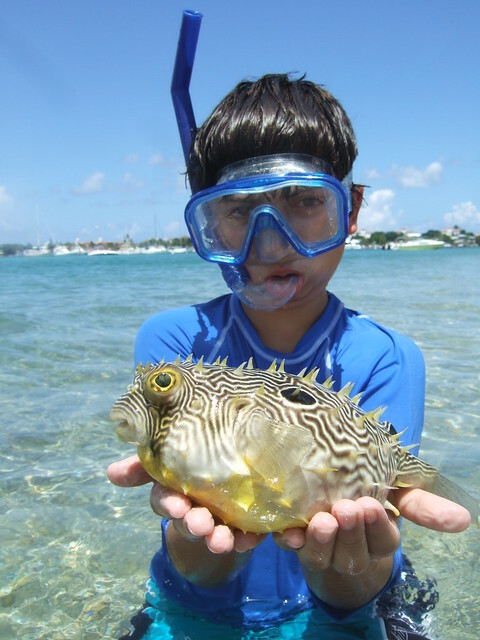 Christopher with a striped burrfish. We turned over rocks and found dozens of large swimming crabs hiding underneath, and of course, we had to give chase to those too!!! Most would get away but every now and then someone would come up with a nice big crab in their net, and we’d all check it out! 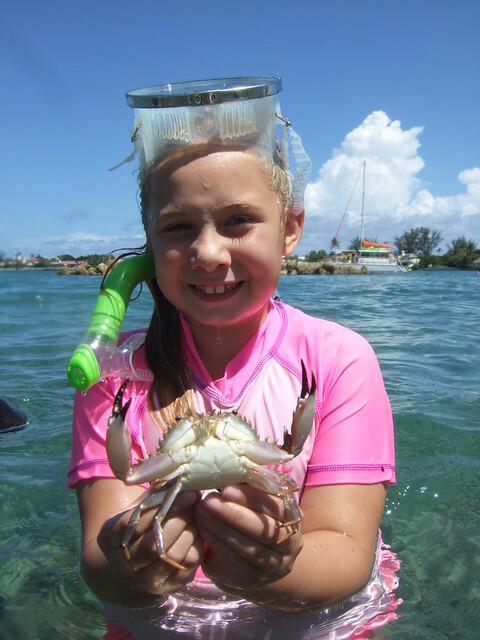 Madison catches a nice swimming crab! 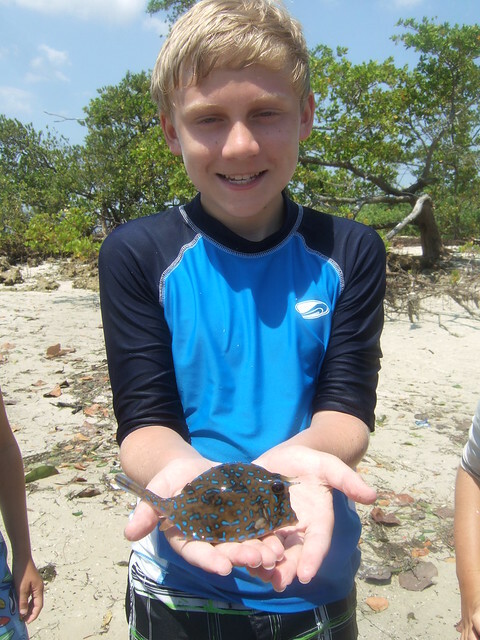 We stopped by Little Munyon Island a few times and found some really big beaded starfish burrowing in the sand. 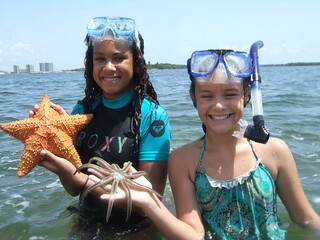 We didn’t have much luck finding any 9 armed starfish, but beaded starfish were everywhere!!! Let’s just say, we had a blast finding them!!! 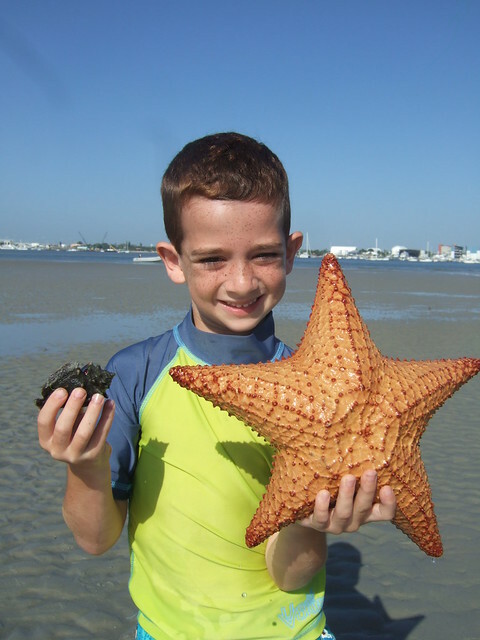 Brian finds a beaded starfish! We spent an hour or so everyday snorkeling around the Big Sandbar and watched juvenile barracudas chase menhaden all around us. 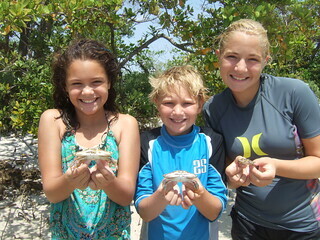 We saw dozens of fighting conchs along the bottom and collected a few to check out before letting them go. I know Andy had FUN finding one after another! 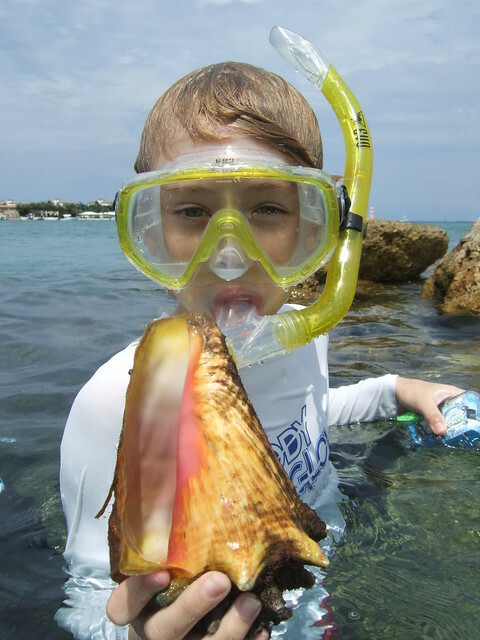 Andy finds another fighting conch. We were so busy having Non-stop Adventure Fun, that before we knew it the week had come to an end! I can guarantee that none of us was ready to call it a week!!! It does seem the more fun your having, the faster time flies!!! Needless to say, we had a fabulous week!!! 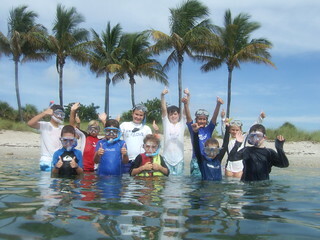 We had some awesome sea creature encounters, and we learned a pile of stuff along the way!!! It just doesn’t get any better than that!!! And that’s just the way I love it!!! I just can’t wait to do it all over again!!! 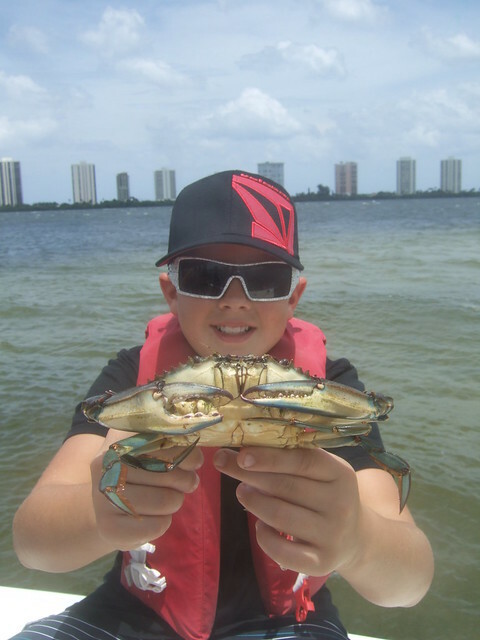 Mac catches another blue crab! 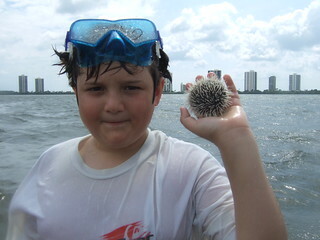 Matthew finds a big sea urchin! 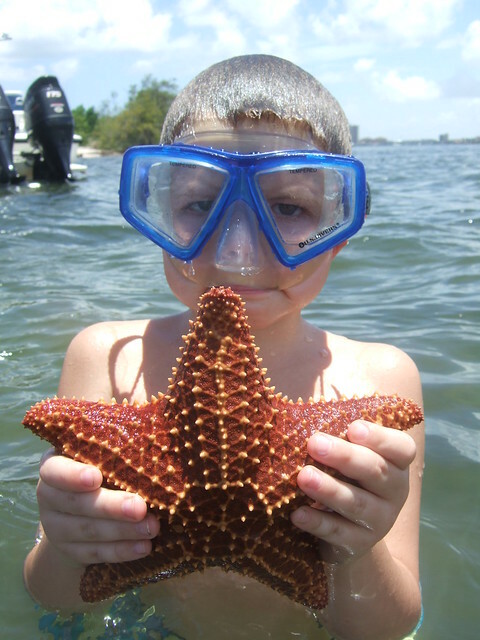 Brandon finds another beaded starfish! 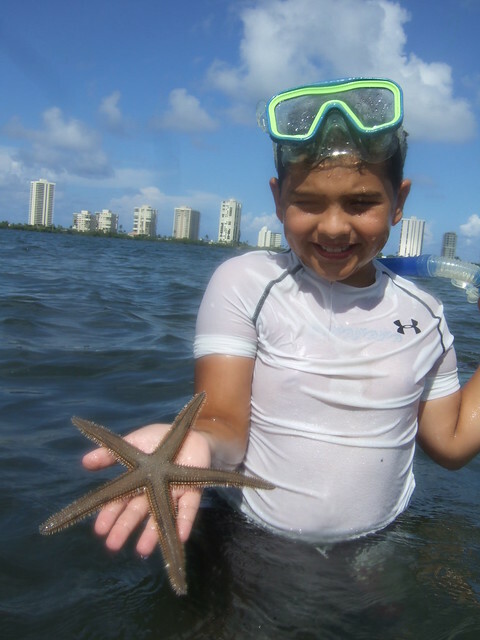 Samuel finds a cushion starfish! 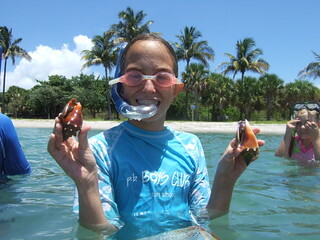 Harper finds 2 more fighting conchs! 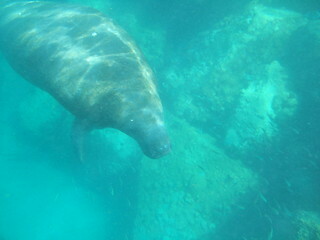 Another friendly manatee stops by for a visit! To check out the rest of the photos from this weeks session, please click on “Check out our FLICKR photostream” found a little bit down on this home page on the right side and go to “July 10 – 13, 2012 PM session”. 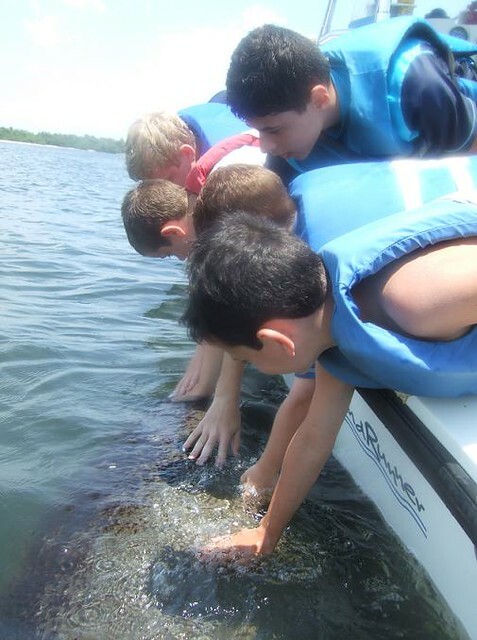 Sea Creature Encounters, Big and Small!!! 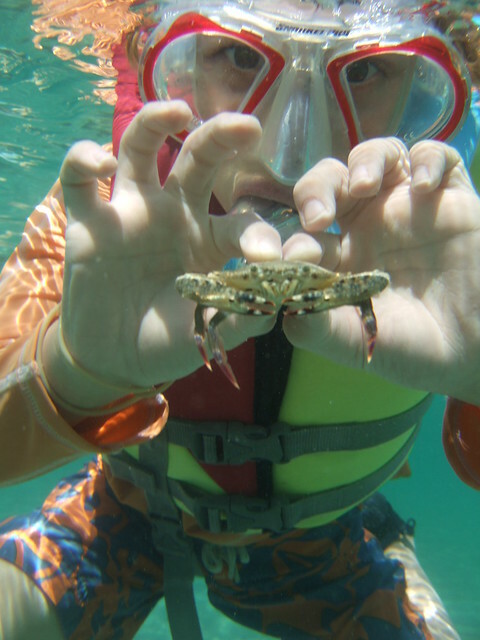 We’ve just finished up the first week of July having fun in the sun and having all sorts of cool sea creature encounters. From Big to Small, we saw them all!! The very first morning we had a wonderful manatee encounter that was followed up by a pod of bottlenose dolphin hanging just off the bow, to loggerhead and green sea turtles swimming lazy circles around the boat, and then having the ocean come alive around us as thousands of bonitas boiled the surface eating anchovies for miles around. Needless to say, it was darn exciting, and we had a blast catching big bonitas left and right!!! What a way to start the very first day!!! 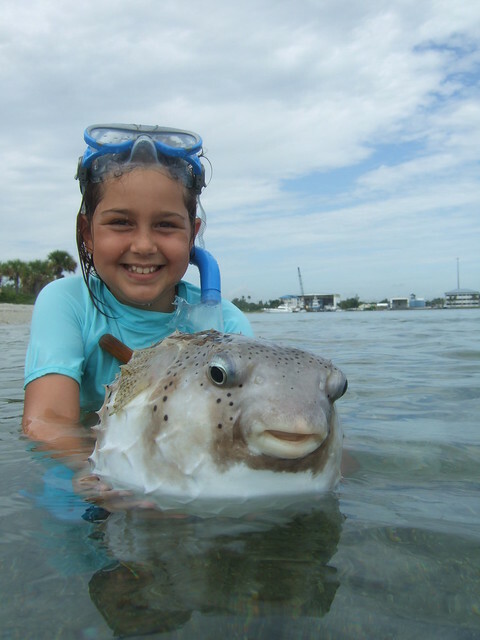 The next day we went seine netting and caught numerous striped burrfish, juvenile barracudas, pufferfish, hogsnappers, yellowtail snappers, filefish, mojarras, grunts by the hundreds, pipefish, pinfish, grass shrimp, pink shrimp. You name it and I think we found it!! We had so much FUN, nobody wanted to quit when it was time to go!!! 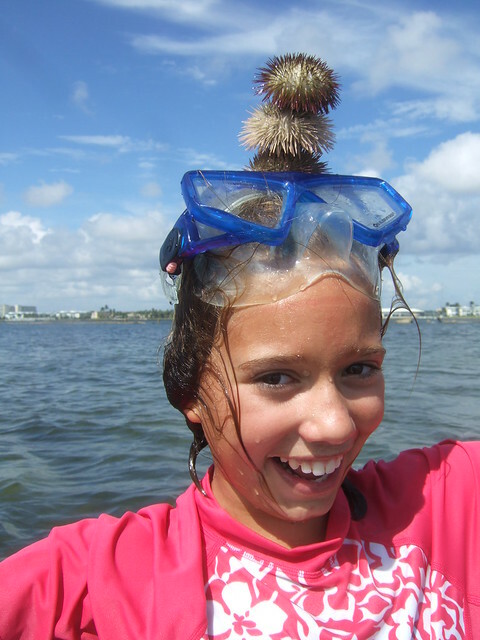 From there we snorkeled the sea grass beds and found 4 different species of sea urchins, cushion starfish, 9 armed starfish, beaded starfish and even a nice horseshoe crab. It was just great!!! 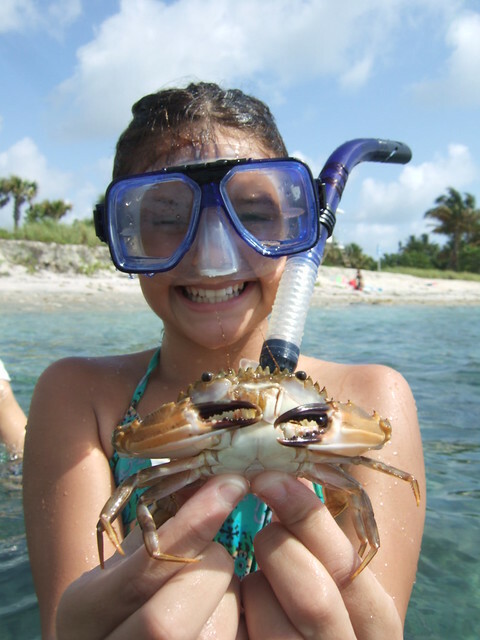 We spent other days snorkeling the Rock Garden, the Big Sandbar and all around Peanut Island and saw fighting conchs and queen conchs everywhere, found dozens of large swimming crabs, saw barracudas and snook by the hundreds, reef fish galore and caught more sharp nosed pufferfish with our hand nets than we could count!!! That kept us busy having FUN for hours!!! 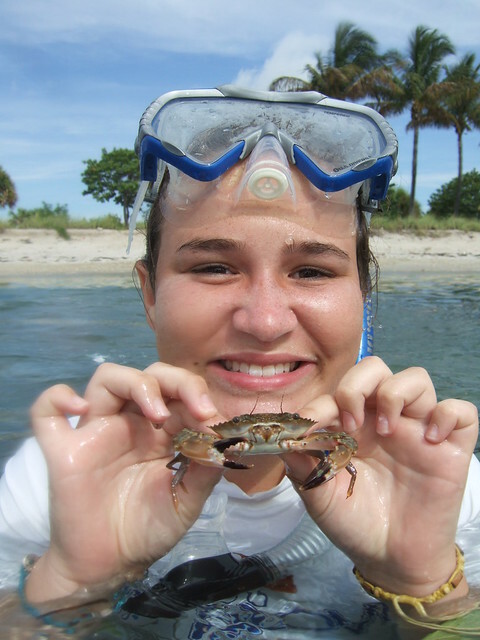 Valeria having FUN with this Giant swimming crab!!! 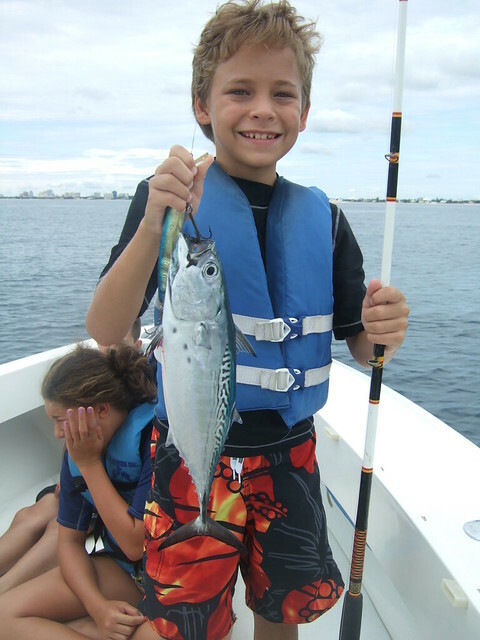 Carter with a large filefish. We ended the week having a most awesome manatee encounter at the Rock Garden where 2 very friendly manatees spent a few minutes swimming all around us and in between us, and acting as if they wanted us to tag along for the day. And if we could have kept up, we would!!! We were having that much FUN!!! Needless to say, we had non stop FUN and ADVENTURE during all these cool sea creature encounters!!! From the very start to the very end we had fun fun fun, all week long!!! I wish you could have joined us!!! We had a BLAST!!! I’ll let some of my favorite pictures do the rest of the talking!!! Enjoy!!! 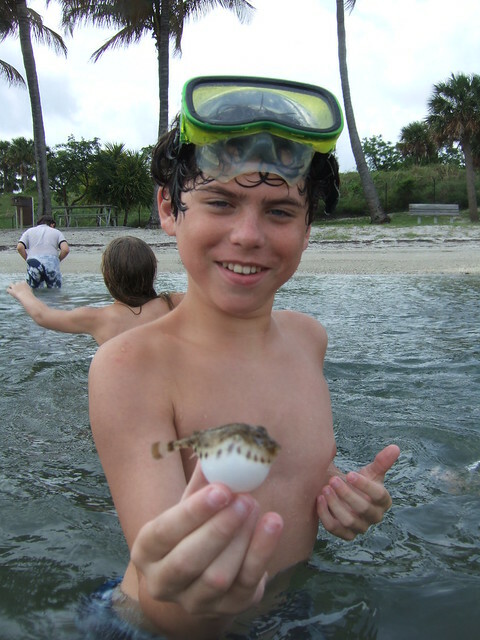 Michael with a striped burrfish. 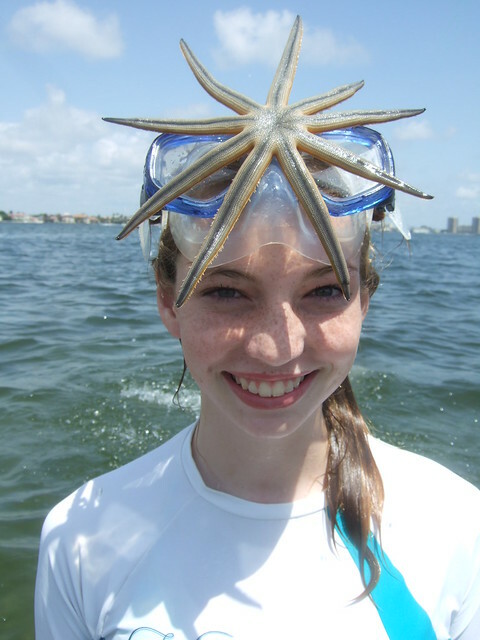 Kristine with a 9 armed starfish. 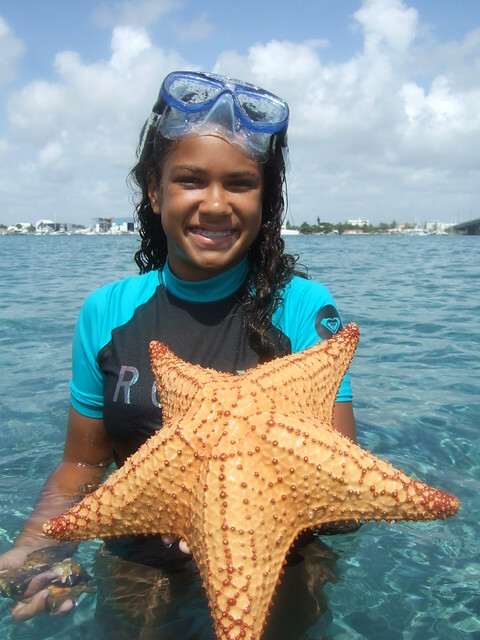 Brianna with a cushion starfish. 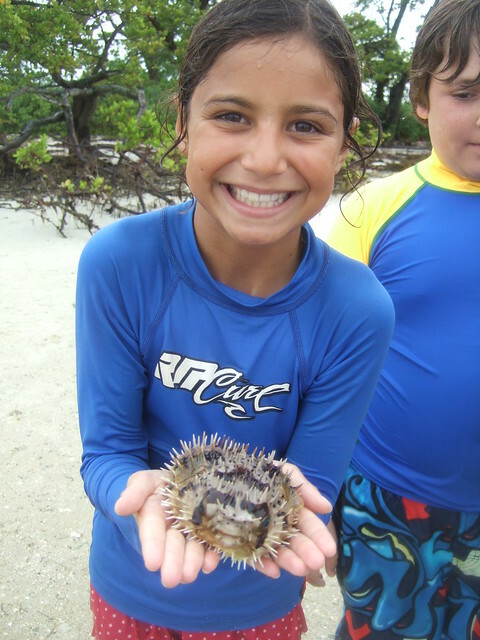 Elissa with 3 species of sea urchins. 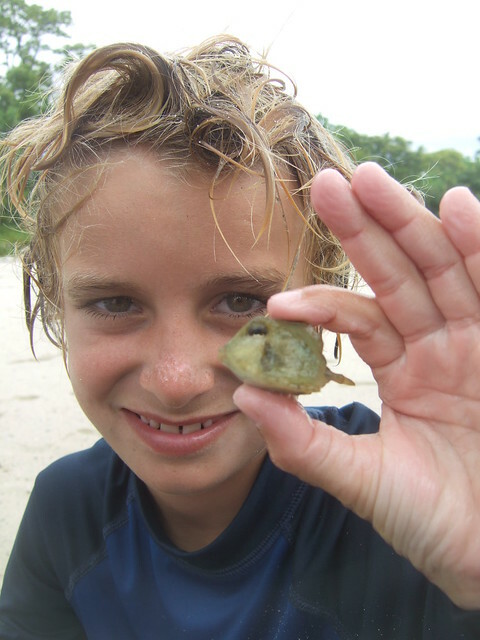 Koen with a striped burrfish. 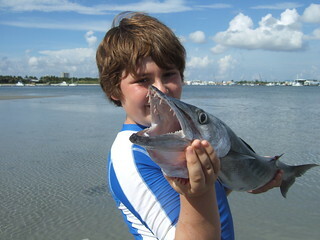 Stephen with a nice barracuda. 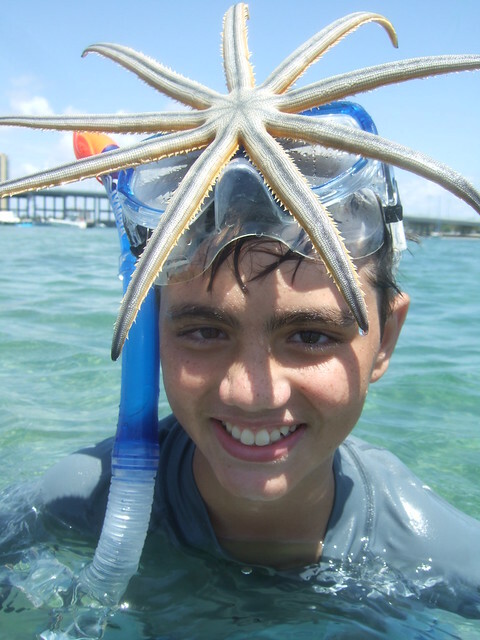 Nathan with a cushion starfish and sea urchins. 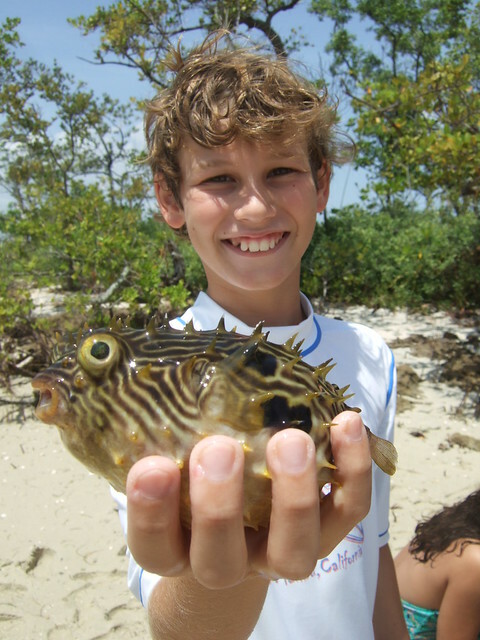 Eric with another striped burrfish. To check out the rest of the photos from this weeks session, please click on “Check out our FLICKR photostream” found a little bit down on this home page on the right side and go to “July 3 – 6, 2012 morning session”. We’ve just finished up another week of afternoon Fun and Adventure around the Lake Worth lagoon, and what a fabulous week we’ve had too!!! 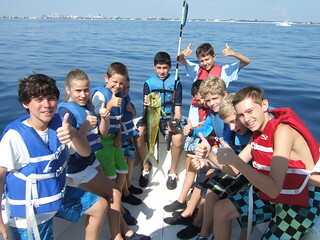 Just like the morning group, we spent the week boating up and down the intra coastal waterway, snorkeling the Rock Garden, exploring the Big Sandbar, fishing my secret spots and catching tons of fish non stop! We went crab catching and caught blue crabs, spider crabs, swimming crabs. You name it, and I think we caught it!! We were having a blast!! 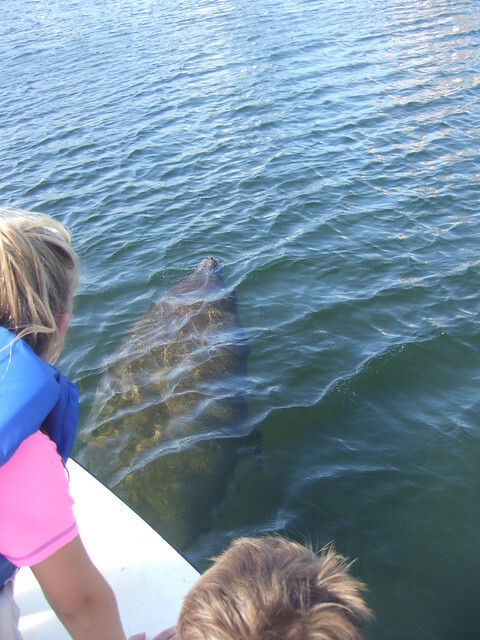 We also went back to observe those friendly manatees we saw with the morning group, and sure enough, they stopped by for another awesome visit!!! 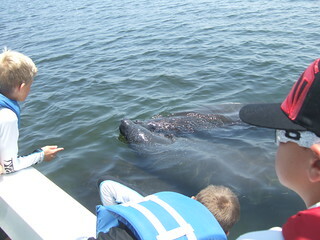 Friendly manatees stop by for a visit. 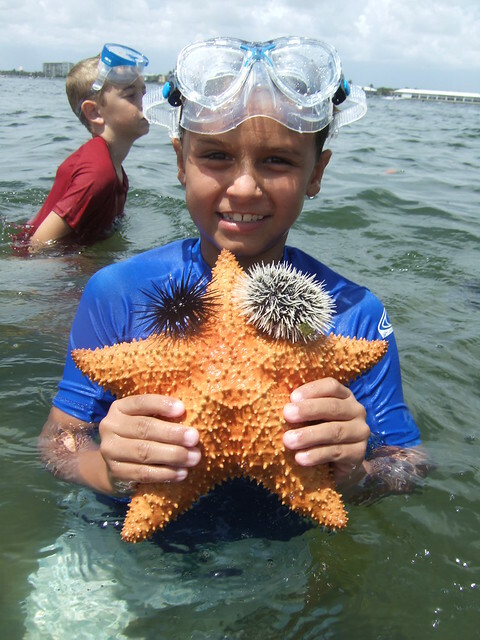 During the week, we caught swimming crabs under rocks, found sea urchins and starfish galore, and topped that day off finding a big horseshoe crab cruising around in the shallows too. They are always a great find!!! 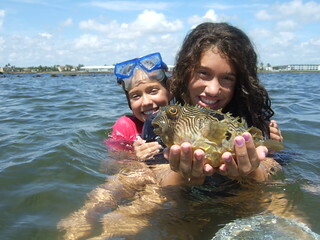 We found fighting conchs, beaded and cushion starfish, huge queen conchs, hermit crabs and chased pufferfish non-stop! 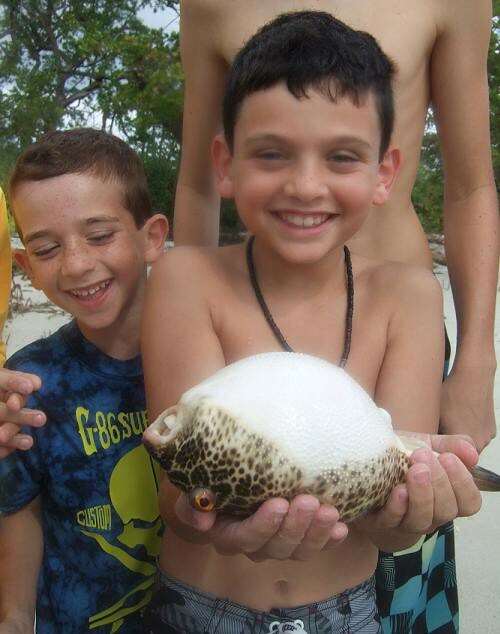 We even caught some pufferfish bare handed which isn’t easy to do, and most everyday, had a blast at the Big Sandbar finding all sorts of cool things! Needless to say, we had non stop FUN and ADVENTURE from the very start, all week long!!! I wish you could have joined us!!! We had a BLAST!!! I’ll let some of my favorite pictures do the rest of the talking!!! Enjoy!!! 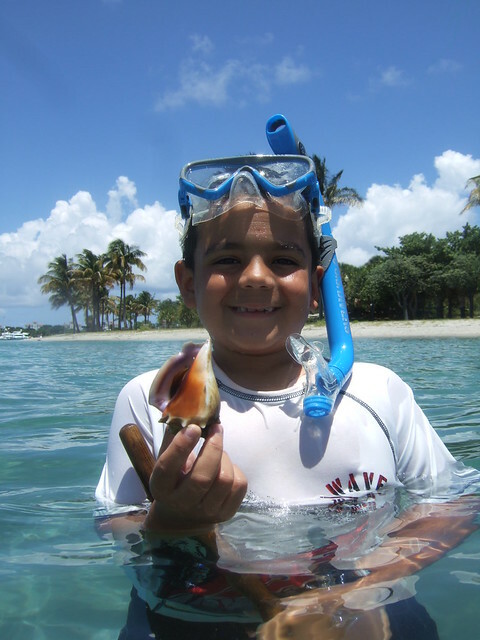 Stephen finds a nice queen conch. 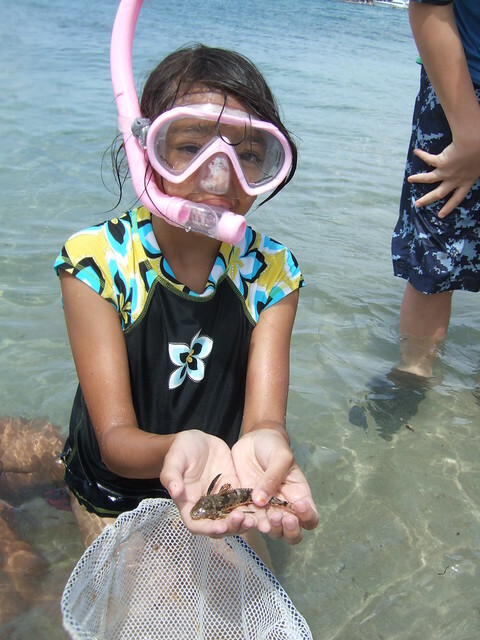 Armida finds a sea robin. 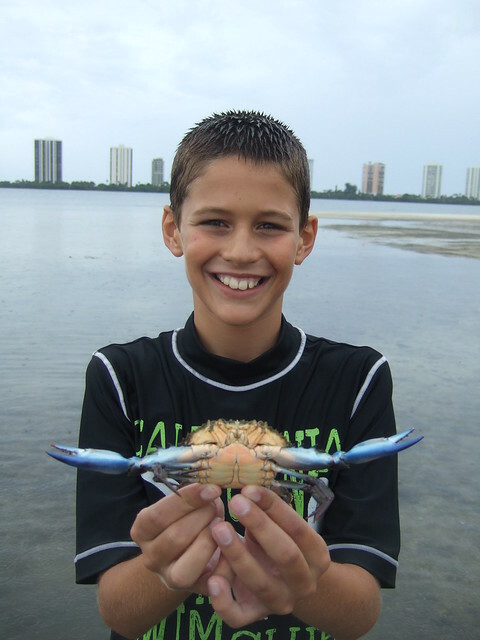 Casey holds a BIG blue crab. 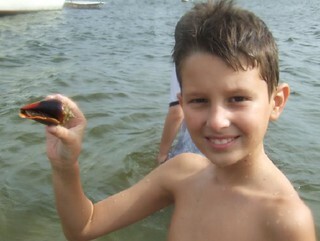 Sawyer catches a BIG swimming crab. 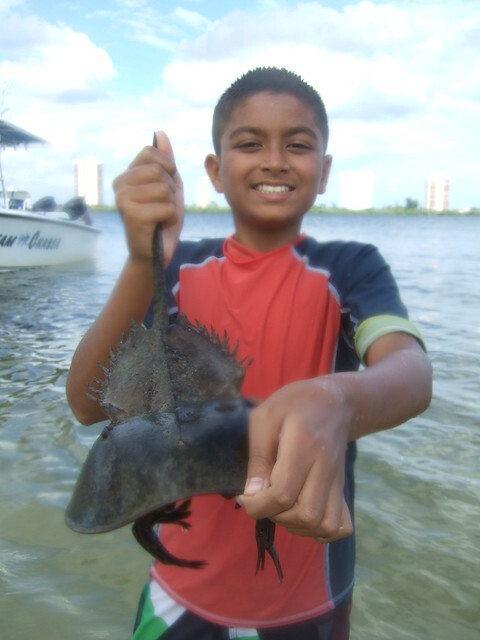 Rujul finds a horseshoe crab. 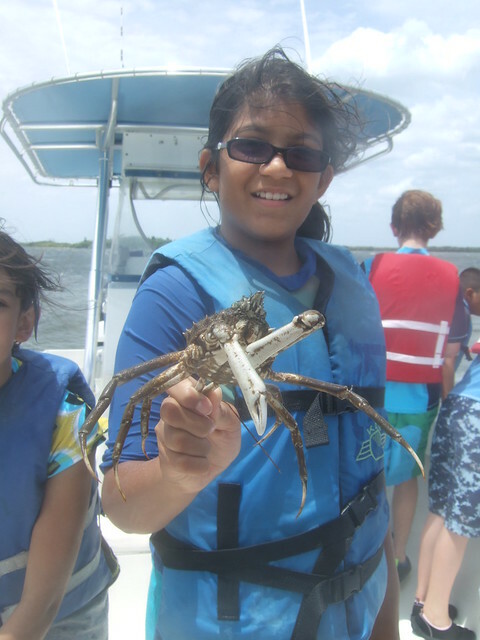 Trusha holds a large spider crab. 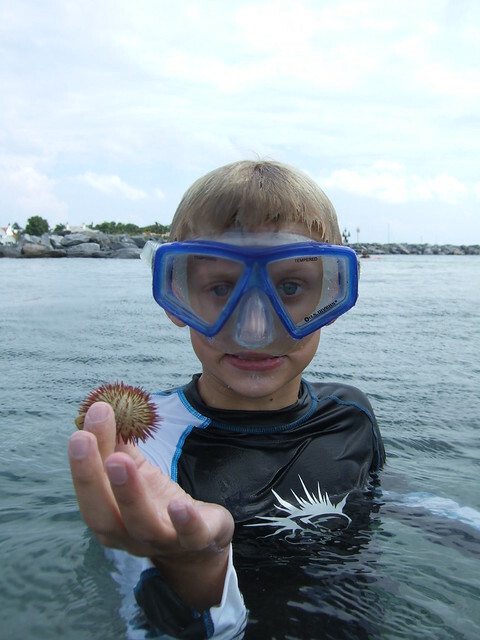 Sawyer finds a variegated sea urchin. 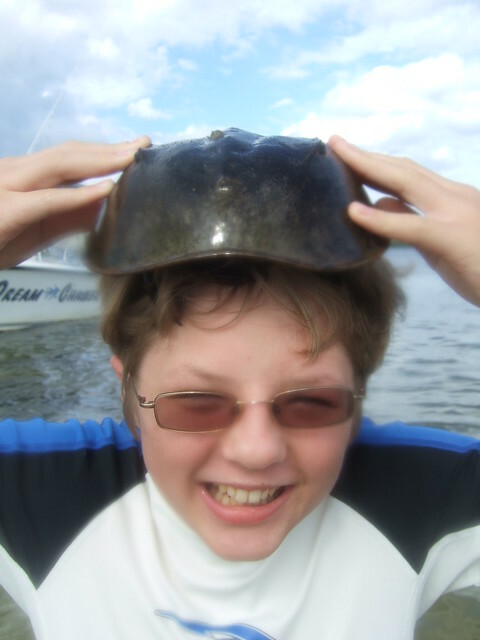 Seth having FUN with a horseshoe crab. 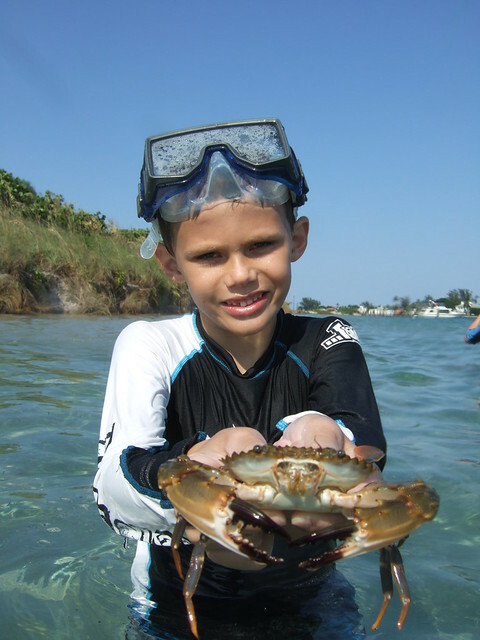 Bradley catches a monster swimming crab. 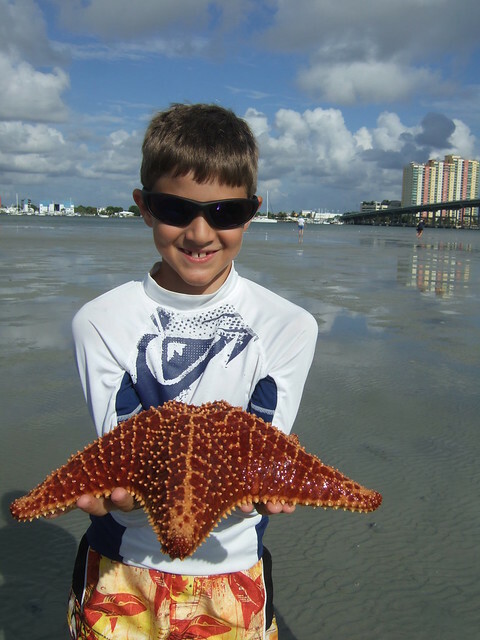 Caden with a cool starfish. To check out the rest of the photos from this weeks session, please click on “Check out our FLICKR photostream” found a little bit down on this home page on the right side and go to “June 26 – 29, 2012 PM session”. FUN FUN FUN… ALL WEEK LONG!!! 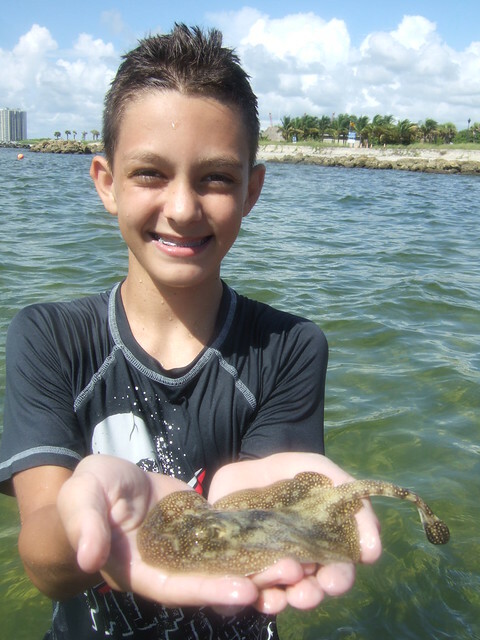 We’ve just finished up another week of summer time Fun and Adventure around the Lake Worth lagoon, and what another wonderful week we’ve had!!! 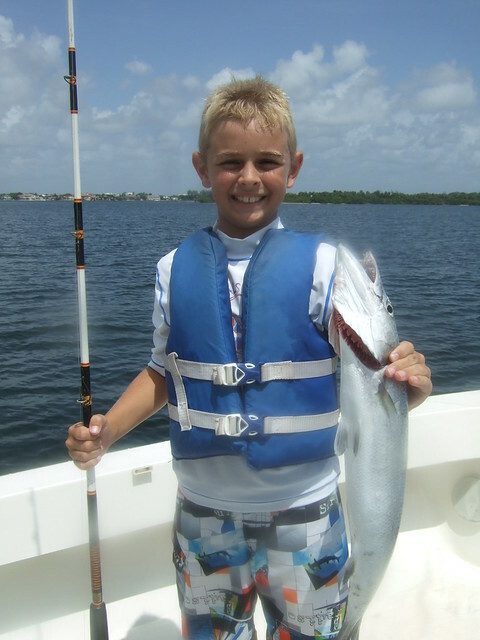 We spent the week boating up and down the intra coastal waterway, snorkeling the Rock Garden, exploring the Big Sandbar, fishing my secret spots and catching tons of fish non stop! Another day we watched manatees eat sea grass all around the boat and later that day we had a ball watching a few bottlenose dolphin frolic just off our bow. We took a quick run offshore to observe some loggerhead and green sea turtles in crystal clear water and came upon a sargassum seaweed line that had mahi mahi swimming up and down it everywhere!!! They were literally jumping out of the water all around us!!! We cast out a line with a plug on it and before you knew it, Neil had one in the boat!!! Way to go!!! 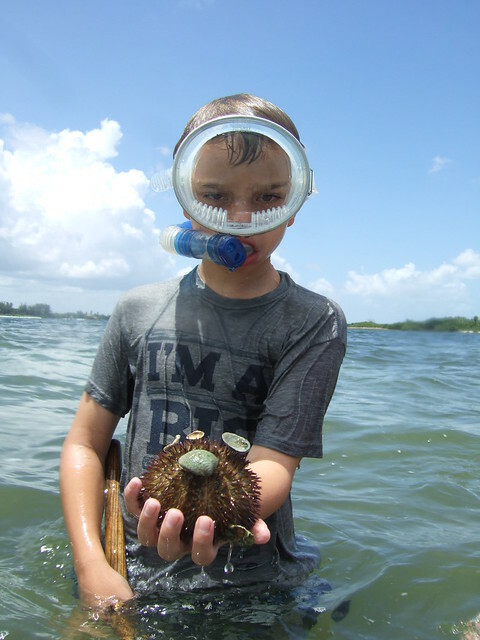 During the week, we caught swimming crabs under rocks, found sea urchins and starfish galore, and topped that day off finding a big horseshoe crab cruising around in the shallows. We found fighting conchs, beaded starfish, hermit crabs and watched a school of reef squid change all sorts of colors right before our eyes! 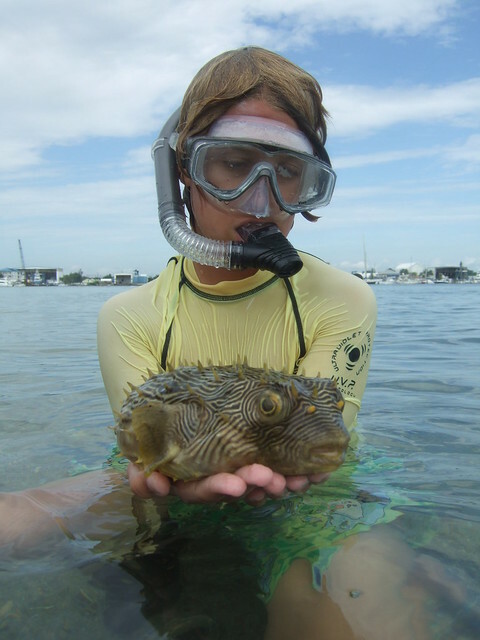 We caught pufferfish bare handed and found some really cool scrawled cowfish, trunkfish, puffers, pipefish and juvenile barracudas, etc while seine netting . 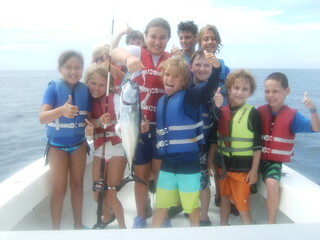 I think the huge checkerboard puffer and scrawled cowfish were the favorites that day! 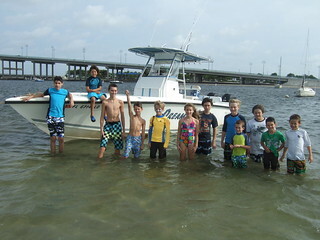 In between all that, we had a blast at the Big Sandbar finding all sorts of cool things! 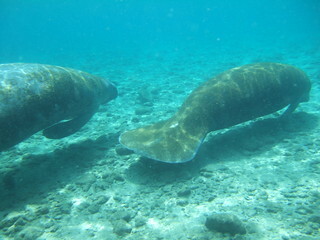 We ended the week having one of the very best manatee encounters I’ve ever seen!! While anchored behind Munyon Island, we had 3 manatees come right up to the the boat, lay directly against the side and roll over like they wanted their tummies scratched. Of course we had to oblige for a few seconds. For 45 minutes they just layed there and we had a ball watching them from inches away!!! It was AWESOME for everyone!!! What a way to end the week!!! Needless to say, we had non stop FUN and ADVENTURE from start to finish and thats just the way I love it!!! I’ll let some of the pictures do the rest of the talking!!! Enjoy!!! 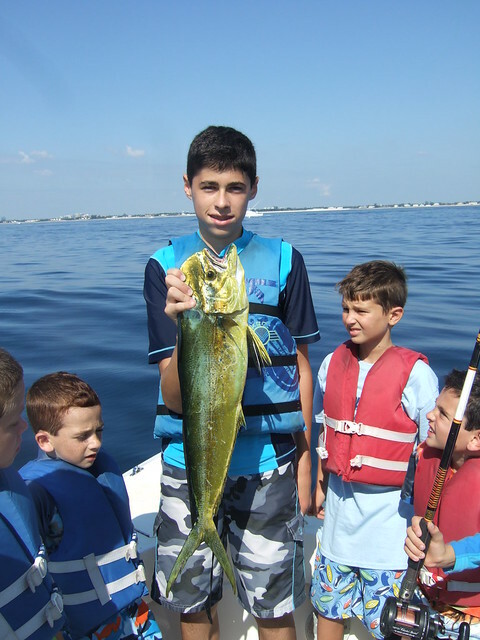 Neil catches a nice mahi mahi. 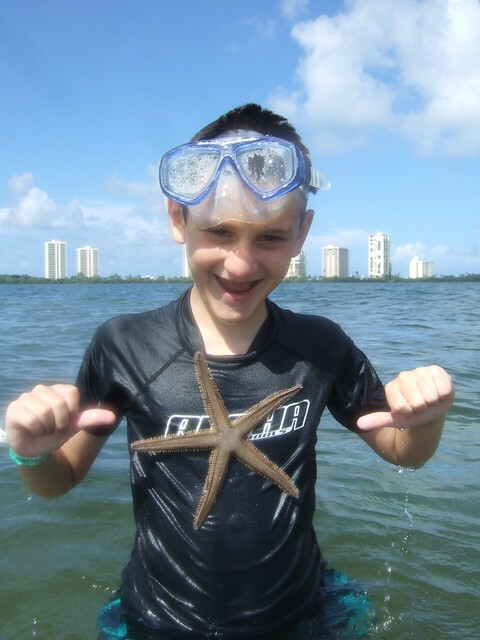 Samuel finds a BIG cushion starfish. 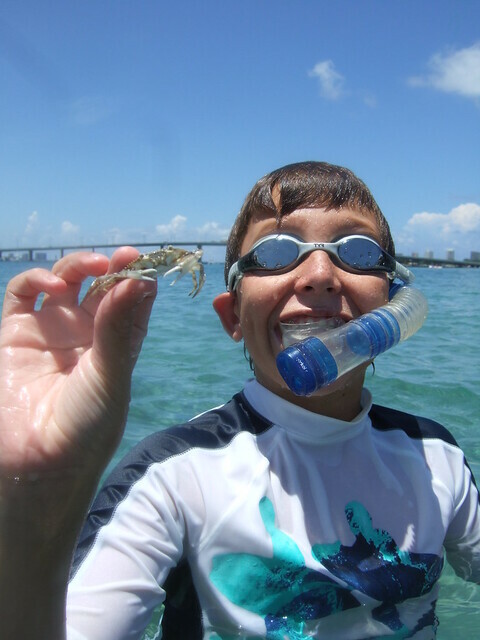 Alex catches a BIG swimming crab! 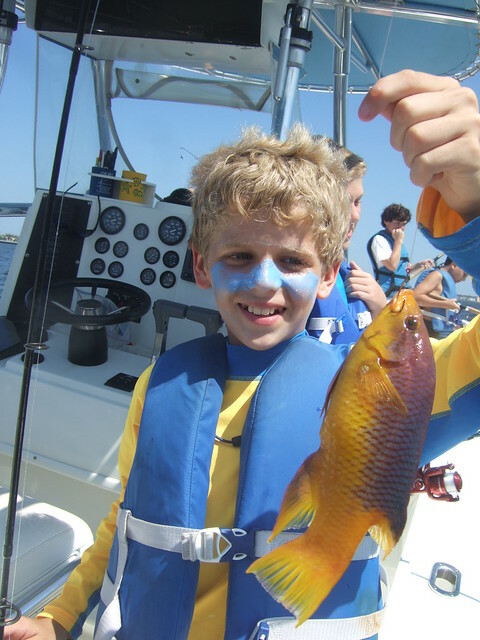 Colin catches a spanish hogfish. 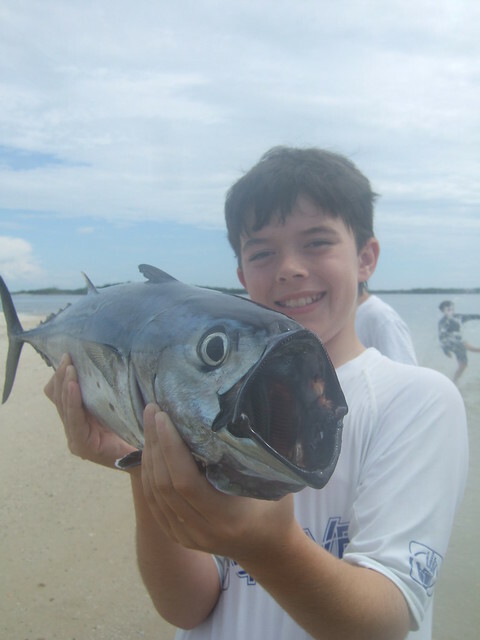 Robby with a scrawled cowfish. 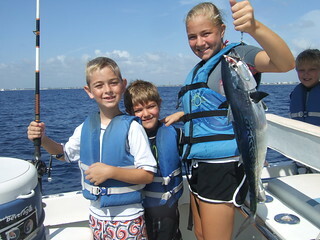 Aaron and sammy with a checkered puffer. 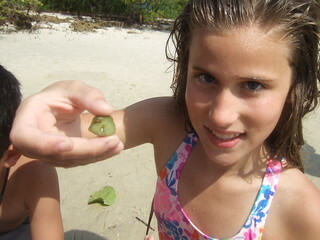 Bella with a tiny trunkfish. 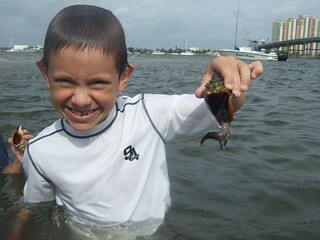 Joey finds a fighting conch. 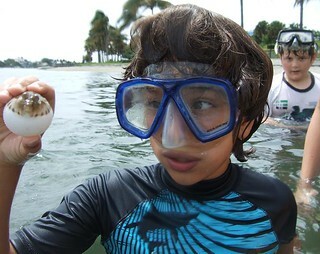 Joshua finds a west indian sea egg. 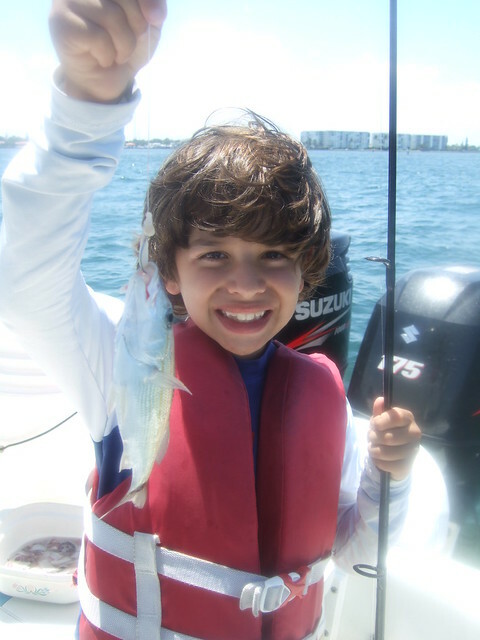 Elias catches a tiny pufferfish. 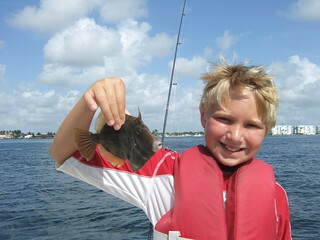 Evan finds another nice fighting conch. To check out the rest of the photos from this weeks session, please click on “Check out our FLICKR photostream” found a little bit down on this home page on the right side and go to “June 26 – 29, 2012 AM session”.